Guess what I got for Christmas? Audrey McClelland is one of Santaâ€™s elves, Iâ€™m convinced. I participated in the #ATT Twitter giveaway with @AudreyMcClellan the week of Christmas and won the Samsung Galaxy Tablet 8.9. I was thrilled! I was dying for a tablet as Iâ€™m always on the go and a tablet is perfect to throw in your purse and bring to events, meetings with clients or just to keep you busy while waiting for an appointment. Oh did I mention not only did I win it the week of Christmas it arrived on my door before Christmas. Yay! Merry Christmas to me! This tablet is an expression of you â€“ not its maker. If you buy the wrong tablet, youâ€™re at the mercy of the manufacturer regarding how much you can customize or personalize your screens. But the beauty of Android is that you have much greater flexibility to arrange things however you want. Youâ€™ll have multiple home screens to compose and design, plus live wallpapers to express your mood and personality. The Tab also offers you the freedom of TouchWizÂ®, the intuitive user interface that allows you to quickly drag and drop your icons, widgets and Live Panels with only the touch of a finger. Now, reorganizing your tabletâ€™s menus and navigational options will be simple and straightforward. A screen so lifelike youâ€™ll want to touch it. The Tabâ€™s WXGA-TFT touchscreen redefines high resolution. Every image has amazing color, radiance, and clarity to capture all the detail of real life. The Tabâ€™s dimensions give it an aspect ratio that lets you see more of the original image, without cropping or black bars. Now when you watch a movie with $100 million in special effects, you get the full impact. When you read eBooks or emails, every letter of text is razor sharp. Video chatting is more like talking face-to-face. And when your finger touches the responsive screen, every function is smooth as silk. Performs at a higher level. So you can, too. Surf the internet just like on a PC, and get the full enjoyment of AdobeÂ® FlashÂ® Player compatible sites, games, and videos. 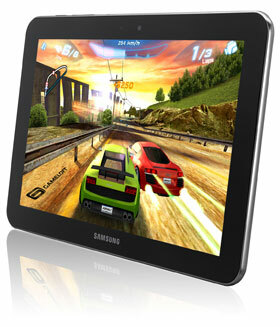 The Dual core 1GHz processor runs every function and app effortlessly. A full gig of ram gives you plenty of memory. The Tabâ€™s Android â„¢ 3.1, Honeycomb platform is the proven gold standard to perform the full range of Google services like optimized Gmailâ„¢ and Google Mapsâ„¢. Does several things at once. Sound familiar? Multi-tasking is the new normal. None of us have time to do only one thing at a time. The Tab keeps you up-to-the-second with widgets and live panels that update constantly. And you can have more than one window open at a time to bounce around on. 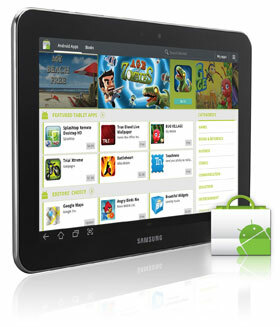 Access the Android Marketâ„¢ for thousands of apps that keep your life moving with the speed you need. Sometimes your Tab is for work, sometimes itâ€™s for play, and sometimes itâ€™s hard to tell the difference. Take gaming to the next level. The Tab 8.9 is gaming heaven. It has the speed and processing power to run any Android or AdobeÂ® FlashÂ® Player compatible game with no buffering, stalling, downloads, or plug-ins. And the screen shows every dragonâ€™s scale, every gold doubloon, and every sword glint with eye-popping, heart-pounding detail. You canâ€™t be too thin. Itâ€™s only .34″ from front to back, which is about as thin as a typical ballpoint pen. 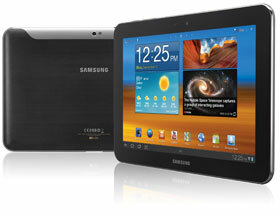 The Tab also weighs just 447 grams â€“ so light that youâ€™ll hardly notice it in your briefcase or purse. The body is sleek yet easy to grip, and fits comfortably in your hand. Itâ€™s the perfect portable device to take anywhere and connect through any Wi-Fi hotspot without monthly service fees or carrier contracts. Your Tab is the hub of your social universe. For social networking, the Tab offers Social Hub, the pre-loaded app which organizes all your favorite sites in one, easy-to-access location. Watch movies and TV shows anytime and everywhere. 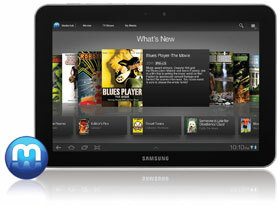 The Samsung Galaxy Tab 8.9 gives you access toÂ Media Hub, where movies and TV shows can be rented or downloaded for purchase. When you choose to purchase, your content can be stored in the cloud and viewed on up to five other Media Hub enabled devices, or even watched on your television through Smart Show with an HDMI video-out adapter (sold separately). You can watch it now, or later for offline viewing. The list of content available is refreshed daily to include the latest episodes of last nightâ€™s TV shows. When you choose to watch something, you can begin watching within minutes with progressive download. Want more places to get movies? Not a problem. The Google Videos app is preloaded, letting you rent thousands of movies starting at $1.99. Get Amazon Instant movies with Unlimited Streaming videos offering more than 2,000 movies and 500 TV shows. If youâ€™re an Amazon Prime user, you get movies absolutely free with membership. Many movies and videos are AdobeÂ® FlashÂ® Player compatible, and youâ€™ll be able to watch them all. Most networks offer free shows on their own websites, and youâ€™ll be able to access the free content with a browser based website for TV shows. Want more options? Get the IMDB app from Android Market to watch movie trailers, or the Vevo App for premium music videos. Itâ€™s like a bookwormâ€™s heaven. The Amazon Kindle app is preloaded, giving you access to the largest selection of the books (including New York best sellers) and periodicals people want to read. You even get free sample books, chapters and popular classics. Google Books comes preloaded, offering you free out-of-trademark books such as â€œThe Adventures of Tom Sawyer,â€ â€œAlice in Wonderland,â€ â€œPride & Prejudiceâ€ and many more. 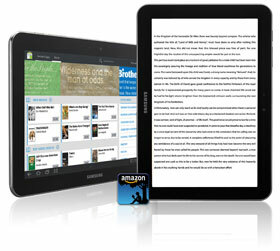 You can purchase thousands of books via Android Market. Transform your digital living experience by enjoying your content on multiple screens, anytime, anywhere. You can wirelessly stream your movies, music and photos from your smartphone, or tablet to your Smart TV, PC and to other DLNA CertifiedÂ® devices. 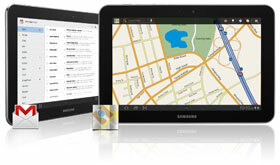 Samsung AllShareâ„¢ seamlessly puts your music, memories and videos in harmony. Disclaimer â€“ I was not required to write this post. The thoughts and opinions expressed here are my own.